We were looking for a solution which would really improve the Service Desk team’s response time, ensuring all issues would be dealt with in a timely manner. Why did you choose NetSupport SeviceDesk? We wanted a product that was really easy to use and had a range of features to help us deal with all service desk related issues. 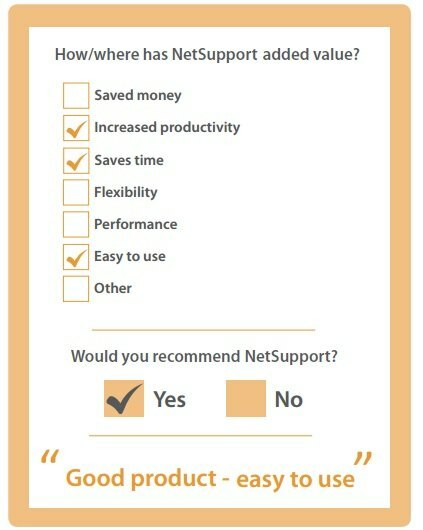 NetSupport ServiceDesk offered just that: it’s a userfriendly solution with a good, clear user interface. Our helpdesk team members use NetSupport ServiceDesk to provide live support to users. We also have it available for use by specific users on specific PCs for Display Screen access. The fact that we are able to share control with a user’s screen when they report a problem, allows for quick one-stop problem resolution.